What is freezer burn? How can I avoid it? Is the frost build-up in my freezer normal? What temperature should my freezer be? My freezer is not freezing. Help. Standalone, chest or upright freezers operate like a refrigerator's freezer and enable families to purchase food in bulk at a savings. Proper maintenance will reduce energy consumption and keep the unit operating efficiently. To perform optimally, a freezer thermostat should be set at zero degrees Fahrenheit (-18 degrees Celsius). If your model does not have a thermostat, use a thermometer to check the temperature. Adjust the freezer control as needed. Use a damp rag and a small amount of dish detergent to clean the interior. For spills and stickiness in the interior and on the gasket (door seal), try a spray cleaner like Goo Gone. You can get rid of freezer odor by using a deodorizer. We like this one – Fridge Aid, a recyclable and biodegradable, high-absorbency paper honeycomb filter. According to the manufacturer, it's laboratory-tested to be 50 times more powerful than baking soda in absorbing powerful food odors. The gasket keeps cool air inside of the freezer and warm air outside of it. A worn and torn gasket requires the freezer to use more energy to do its job. Fortunately, replacing a gasket is inexpensive and easy. Chest freezers do not defrost automatically. Manually defrost your chest freezer every six to 12 months or whenever half an inch (or about one centimeter) of frost has accumulated on the freezer walls. Relocate all food from the freezer. Unplug the unit (or turn off the thermostat). After all of the frost has melted, uncover the drain plug (present in most models) and drain the water. When the freezer is dry, power the unit back on. Return the food when the freezer has reached its set operating temperature – zero degrees Fahrenheit (approximately -18 degrees Celsius). Clean the defrost pan: Most upright freezers have a self-defrosting feature. Every eight to 12 hours, the freezer melts frost that accumulates on the coils. The water drains into a shallow pan located at the bottom of the freezer. There's no need to empty the pan, as the water will evaporate naturally. However, you'll need to check and clean the pan periodically. Use warm water and dish detergent to clean the pan. This will prevent odors and curb mold growth. Most models enable you to easily detach the lower grill and slide out the pan. Refer to your owner's manual for cleaning instructions specifically for your model. Unplug the freezer, use a long-handle bristle brush – coupled with your vacuum cleaner – to remove lint, dirt, pet fur and other debris from the condenser coils and then restore power to the freezer. Note that for models with condenser coils located inside of the freezer walls: Since the coils release the heat through the walls, it's wise to position the freezer with plenty of space around it so the heat can dissipate efficiently. When frost has accumulated on the inside walls to a thickness of half an inch (or about one centimeter) or so, remove the food from the freezer, turn off the thermostat or unplug the unit and allow all of the frost to melt naturally. Do not scrape off the ice, as you can puncture a refrigerant line. Once the frost has melted completely, turn the freezer back on, wait for it to reach its operating temperature and restock it with food. Freezer burn is dehydration caused by food being exposed to the air in the freezer. Often packaging insufficiently prevents dehydration. Re-wrapping food in airtight containers or wrappings usually avoids this problem. It's safe to cook and eat freezer-burned food, but the resulting meal is often tough and tasteless. If your freezer is not a self-defrosting model, frost build-up is normal. But when the frost gets to be one half inch (or about one centimeter) thick, it's time for you to defrost it. All freezers should be in the 0 to 8 degrees Fahrenheit (approximately -18 degrees to -13 degrees Celsius) range. However, when you first turn on the freezer, or put a lot of food into it, it may take up to 24 hours for the freezer to reach this temperature range. Your freezer, whether it's combined with a refrigerator or a stand-alone, works better when it's full. That's because the frozen items help keep the other items cold as well as help maintain the cooler temperature in your freezer. If your freezer currently has some extra space – don't worry – we're not telling you to buy more groceries to fill it! All you have to do is throw in any extra ice packs you might have or fill up some plastic to-go containers, plastic baggies and/or empty milk jugs with water and add them to the freezer. (Leave some space when filling them, however, since water expands when it freezes.) It may seem silly, but it'll help your freezer run more efficiently and save you money on your electric bill. 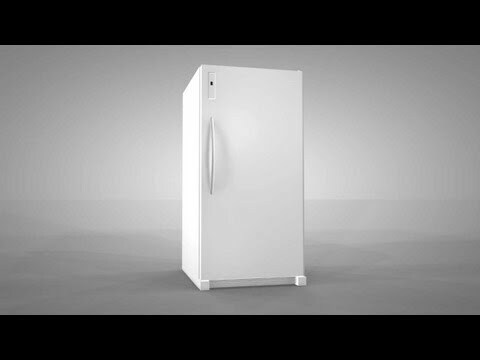 Check out our free freezer troubleshooting and repair help information. Be sure to enter your freezer's model number.